The name Kajukenbo pays respect to the five arts that went into it's creation. KA Korean Karate ( Tang So Do ), JU Judo and Ju-Jitsu ( Danzan Ryu ), KEN Hawaiian Kenpo ( Kosho Ryu), BO Chinese Boxing ( Sil Lum Gung Fu ). Kajukenbo is one of our more traditional martial arts, teaching various methods of self-defense while developing both physical and mental toughness. Kajukenbo was created in Hawaii during the years 1947-1949 following WW II. Five men came together in a quest to create an efficient martial art workable for the streets of Hawaii. Up to that time the traditional martial arts were very restrictive and did not allow the free expression of the ideas of it's practitioners. Training secretly for the first two years the founders were able to blend their arts together away from the prying eyes and unwanted commentary of others. They called themselves the Black Belt Society. Clarence Chang (Sil Lum Gung Fu). Sijo Adriano Emperado is the man credited with putting Kajukenbo together from the roots created by the Black Belt Society. There are now four officially distinct branches recognized in Kajukenbo. The original "Hard Style" Emperado Method. The internal "Tum Pai Method" of Professor Jon Loren. The continually evolving "Won Hop Kuen Do" of Professor Al Dacascos. These branches can be further broken down into other sub divisions that are recognized as individual expressions of the art. Originally a "local boy" fighting art Kajukenbo began it's spread to the mainland and beyond when the original Hawaiian and Hawaiian / Filipino practitioners joined the US armed forces and began to travel around the world. Kajukenbo is now officially practiced in North and South America, Europe, and Asia. 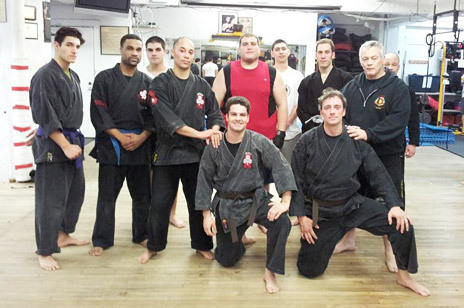 Philip Gelinas was promoted to Professor 9th degree in Emperado Method Kajukenbo by Sijo Emperado in 2001. He also received his 4th degree in the Chu'an Fa Meythod from Sifu Leonard Endrizzi and Sifu Bill Owens.